STORM® is a revolutionary breakthrough in sports nutrition for horses and provides vital nutritional building blocks and co-factors to optimise the management of muscle acidosis during exercise to delay the onset of fatigue. Lactic acid build-up in muscle during any type of fast or strenuous exercise including jumping leads to the build up of hydrogen ions (H+), which make muscles more acidic, as shown by the drop in muscle pH. This muscle acidosis contributes significantly to muscle fatigue and tiring in horses. Tired horses slow down, or can make crucial mistakes during competition. and oxidative stress in muscle during intense exercise. STORM® delays ‘the burn’ of muscle fatigue by improving the body’s natural ability to manage or ‘buffer’ the H+ released from accumulating lactic acid and from other energy-generating biochemical pathways in muscle. Horses are thus able to maintain their peak speed or power for longer, or in the case of more aerobic disciplines such as endurance to perform at a higher intensity before H+ starts to accumulate significantly. Improved management of acidosis during exercise also means that training can be more effective and muscles will recover more quickly from hard work, racing or competition . 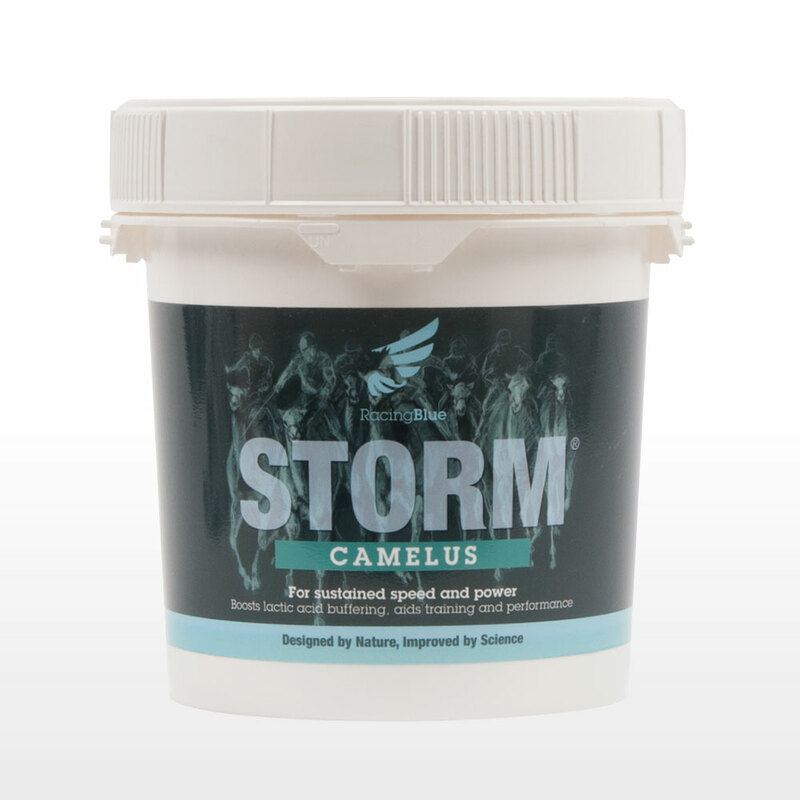 STORM® provides key building blocks to support the synthesis of carnosine, the most important ‘buffer’ in muscle, which is crucial for better handling of H+ during exercise. Carnosine can be thought of as being like a biological sponge that is able to complex with H+ and therefore delay muscle acidosis during exercise. Over a period of 1 month, these ingredients can boost muscle carnosine typically by up to 20% or more. It should be added daily to the normal diet providing part of a normal balanced ration. STORM® Equus is recommended by trainers, vets and nutritionists and is used internationally at the highest level in horseracing. The world class New Zealand Eventing team continues to use STORM® Equus, which they value as part of their horses’ preparation for competition. The combination of active ingredients in STORM® Equus is unique worldwide. This revolutionary product offers an advantage to your horse in any discipline, both in training or competition. STORM® combines ProCarnosine® with other functional ingredients to enhance muscle carnosine and support muscle function. STORM® conforms to the rules of the Federation Equestrian Internationale (FEI) as well as the rules of racing Internationally. It is also specifically approved for use by the prestigious Hong Kong Jockey Club and Singapore Turf Club. As a feed supplement, STORM® should not be taken into racecourse stables on the day of racing as some racing jurisdictions would regard it to be outside of normal feed and water allowed on the day of racing. 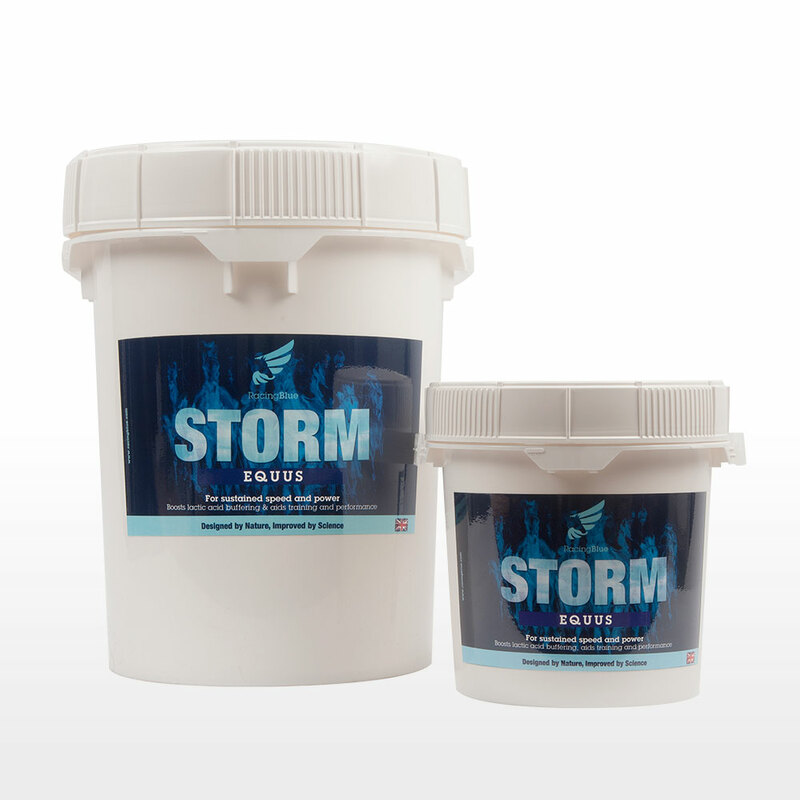 STORM® Equus is available in a 3kg tub that will last a single horse 100 days: a larger 12kg tub is available for larger yards. Each horse will require about 1kg of STORM® per month. For a sustained effect STORM® should be fed for 6-8 weeks prior to racing or competition and then throughout the season. STORM® can then be discontinued out of season or during periods of rest. How do I feed STORM® Equus? Feed 1 scoop (15 g) twice per day. There is a loading period of 6-8 weeks. Feed throughout the racing or competition season. One 3 kg tub provides 3 months supply. Do I need STORM – I feed a balanced diet already? The active ingredients in STORM® Equus are only found in typical racing or competition diets in very small amounts. Research shows that a more concentrated form is needed to boost muscle buffering capacity and fight muscle fatigue. Where in the world are STORM® products available? Will STORM® help maintain muscle health? A well-balanced diet that is low in starch and sugars, fed with plenty of forage that is advisable for horses that are prone to muscle problems such as tying up or rhabdomyolysis. 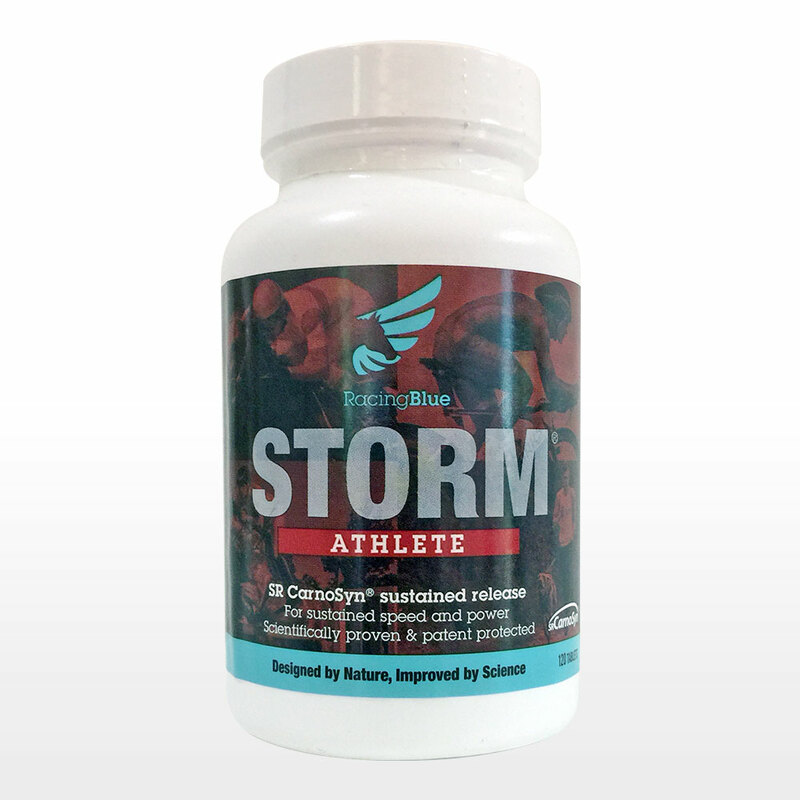 STORM® helps to maintain muscle pH and calcium sensitivity during intense exercise, supporting normal muscle function. Is STORM® Equus suitable for my horse? STORM® Equus is suitable for all horses undertaking intense or shuttle type exercise including racing, eventing, showjumping, polo, reining, cutting, barrel racing and carriage driving. Is STORM® race & competition legal? 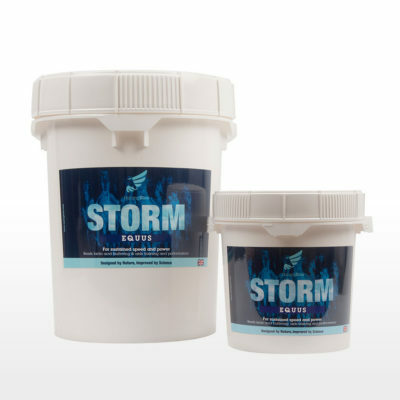 STORM® products were rigourously tested for prohibited substances during development and each and every batch is now tested for specified prohibited substances prior to sale. STORM® conforms to the rules of racing and competition (see individual products for more information). Have you been offered a similar product to STORM? Any product claiming to be the same as STORM® Equus, Canis, Avis or Camelus or to have the same action will not be the same and will not offer you the same high quality, purity or efficacy. STORM® products are uniquely formulated from a combination of ingredients including ProCarnosine®, which is only available through Racing Blue and other synergistic ingredients that have a proven track record. What does STORM® Equus do? STORM® aids training and performance, by targeting muscle acidosis, calcium regulation and oxidative stress during intense exercise. STORM® ingredients effectively boosts the level of muscle carnosine a major physicochemical buffer in muscle. Is there a loading period for STORM® Equus? For a sustained effect STORM® needs to be fed 6-8 weeks before the start of the season in horses. Then feed daily throughout the race or competition season. 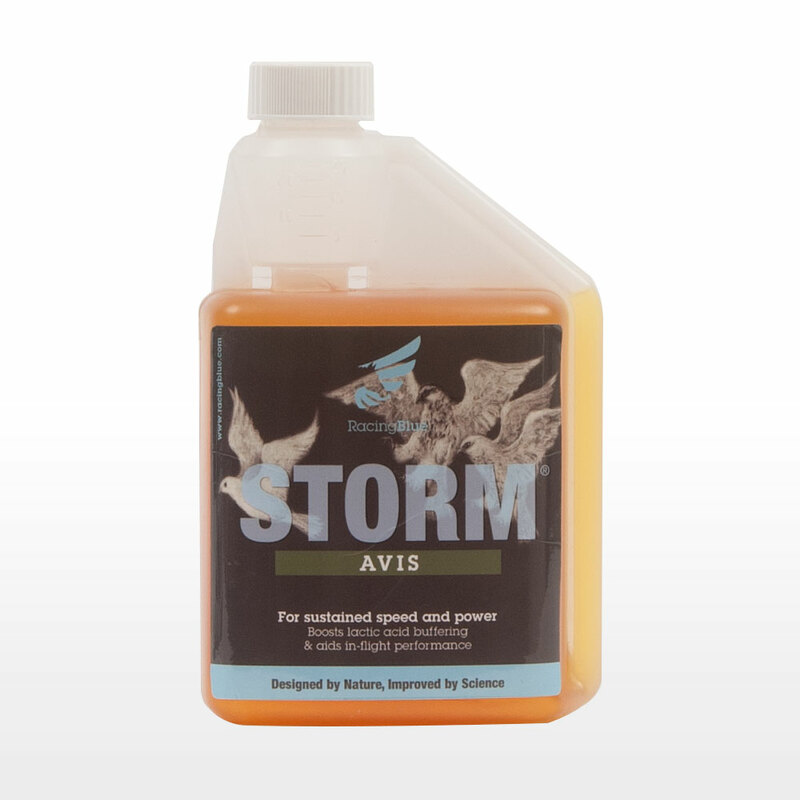 STORM® products are very palatable and easy to feed and can be simply sprinkled over the daily feed for STORM® Equus, Canis and Camelus and added to the water for STORM® Avis. STORM® Athlete comes in an easily swallowed tablet form. Subject to availability, we will use all reasonable endeavours to deliver the products you have ordered as soon as possible after your order is accepted by us. Our policy is to despatch goods the same day the order is received for goods that are in stock. Please note that the order must be received before 12.00am (GMT) to allow same day despatch. International delivery times may vary considerably and are often the result of delays incurred owing to import controls at point of entry. Estimates of delivery times will be provided by us in email format upon despatch from Racing Blue. We outsource delivery to a specialist delivery/courier company (currently FedEx) although we reserve the right to make use of another company at any time. Terms and conditions of carriage by FedEx can be found on their website, Delivery details. Once delivered, the products ordered will become your property (provided they have been paid for in full) and your responsibility, and, except in relation to products that are damaged or faulty when delivered or have been incorrectly delivered, we will not accept and liability for their loss, damage or destruction after they have been delivered. We are super happy with storm. We have 2 jumper horses that were larctested (lactic acid recovery rate and muscle fitness test) one horse we owned longer tested with good muscle fitness rate and recovery rate and the 2nd horse a low score in both. So we decided to put the 2nd horse in a light endurance program and added STORM into her diet. After 5 weeks and another larctest, the 2nd horse scored higher in both scores than the 1st horse. The evidence is black and white to us. We have decided to put both horses on STORM! The horses eat better, don’t loose preparation time as there is less need for breaks to freshen up. They race more consistently and are stronger throughout their races. Great for trainers to have happier and fresher horses. 5 out of 5 I'm a believer! 5 out of 5 Who knows if suppliments work? Storm helped my horse finish the race. He went longer and strong to the end. After using on my race horse for 3 weeks, he started finishing stronger.